Scroll Down for Parts One, Two, and Three. Well, we’ve reached my favorite part, painting! I opted to use multiple painting techniques in order to duplicate the RLM-74/75/76 scheme the V-tail wore. 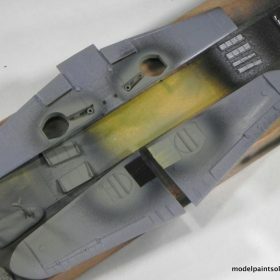 In addition to free hand airbrushing, the use of masking tape for hard lines and stencils for softer effects are demonstrated. In addition I tried out the new Mission Models Gloss and Flat coats and find them to be about as good as the rest of the line: simply awesome. 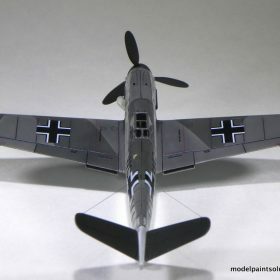 So let’s turn from downwind to final on the Messerschmitt Me-109 G-0 V-tail…………. To lessen the chance that some unseen little speck of schmutz wasn’t waiting to jump onto the inside surface of the canopy, the cockpit was blown clean with the H&S Micro Air Blower. This is an awesome little tool that easily permits you to regulate the intensity of the air stream so it cleans but doesn’t destroy fragile details. Once clean, the canopy was glued in place using Gold CA (Bob Smith). The canopy was then masked using thin pieces of Tamiya tape to delineate the periphery of the clear area of each panel and Mr. Hobby Mr. Mask for the center sections. This technique is described in greater detail in a previous build article here. The wheel wells were masked off with a combination of Tamiya tape and putty. 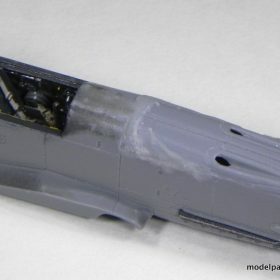 Likewise, the exhausts were covered with thin strips of Tamiya tape and small blobs of putty for areas too irregular for tape. 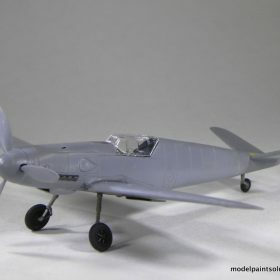 Prior to spraying primer, the canopy was shot with Mission British Slate Grey to which with a few drops of Mission Black was added producing something very close to RLM-66. This ensured that the canopy frames appear to be the interior cockpit color as opposed to the exterior color of RLM-74. The model was then shot with Mission White Primer diluted with Mission Thinner at a ratio of 60:40–Primer to Thinner. This was applied at ~15psi with an H&S Evolution fitted with a 0.2mm tip. 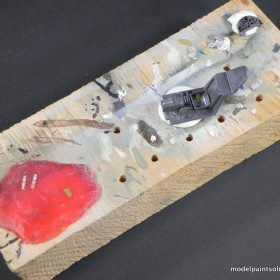 Assorted parts were affixed to a painting board with small blobs of putty and primed at the same time. When dry, the primer was buffed with a sheet of 3200 Micromesh cloth followed by more buffing with a Kimwipe tissue. The modified tail cone was then shot with Mission Aluminum diluted with Mission Thinner at a ratio of 90:10—Paint to Thinner. This was sprayed at ~12psi with an H&S Evolution fitted with a 0.2mm tip. Pre-shading was performed using Mission Models British Slate Grey with a few drops of Mission black added for hue. This was diluted with Thinner-10 at a ratio of 1:1—Paint to Thinner-10. 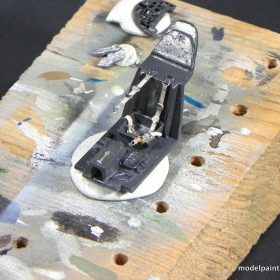 Note: Scroll down to Part One for “Diluting and Spraying Mission Model Paints”. 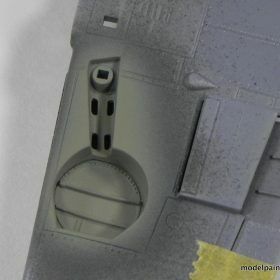 Panel lines were pre-shaded with the 1:1 mix using an H&S Infinity fitted with a 0.15mm tip. The air pressure was reduce from 10psi on the compressor gauge to ~7-8psi using an H&S In-line Fine Pressure Control Valve. In addition to the panel lines, light, random squiggles were shot in the centers of each panel to convey a since of depth when over-shot with the subsequent color coat. In preparation for spraying the color coats, the Mission RLM-74, -75, and -76 were lightened by the addition of Mission White. For 1/72 scale I prefer to add 15-20% White by volume. I opted for 20% for this job. This was easily done by first transferring 1ml of Mission White into an MPS 6ml storage bottle using 3ml pipette. The RLM color was then added until a total of 5ml was obtained. The lightened Mission RLM-76 was diluted with Thinner-10 at a ratio of 60:40—Paint to Thinner-10. This was sprayed at ~12psi with an H&S Infinity fitted with a 0.2mm tip. 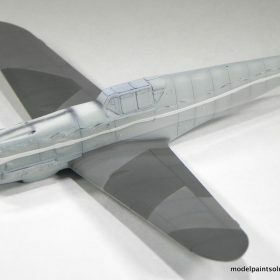 The belly and fuselage sides received multiple coats of the diluted RLM-76 until a color density was reached that permitted a hint of the underlying pre-shading to be easily seen. 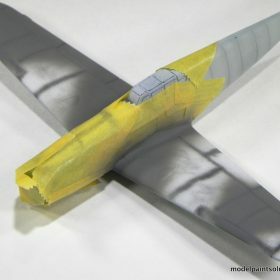 The areas around the wing to fuselage fairings were then masked off with thin strips and Tamiya tape in preparation for painting. 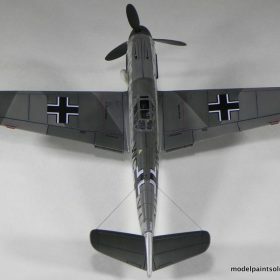 The splinter scheme on the wings was started by painting the RLM-75 areas first. The lightened Mission RLM-75 was diluted with Thinner-10 at a ratio of 60:40—Paint to Thinner-10. This was sprayed at ~12psi with an H&S Infinity fitted with a 0.2mm tip. This was applied free hand. 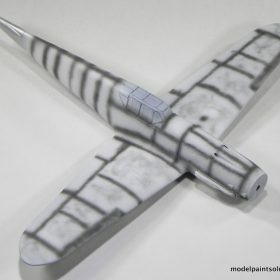 The RLM-75 areas were masked with Tamiya tape and the remaining areas were shot with the lightened Mission RLM-74 diluted with Thinner-10 at a ratio of 60:40—Paint to Thinner-10. This was sprayed at ~12psi with an H&S Infinity fitted with a 0.2mm tip. 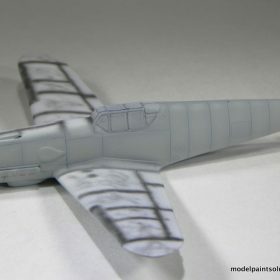 To replicate the soft lines of the RLM-74 and -75 areas on the dorsal fuselage, stencils were made from a sheet of clear acetate plastic. 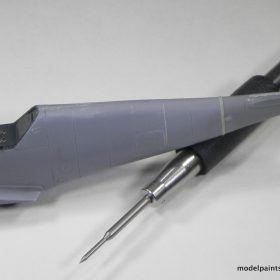 With the stencils held in place with a long “worm” of putty, the lightened RLM-75 was sprayed being sure to maintain a 90-degree angle between the airbrush tip and the stencil. 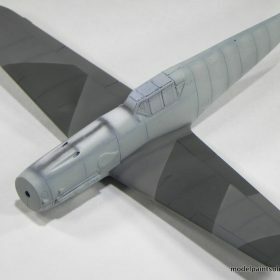 When the RLM-75 areas were dry they were masked with Tamiya tape and the RLM-74 area in the center of the fuselage was sprayed also while maintaining the same 90-degree angle. 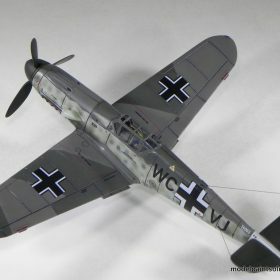 Ah yes, mottling in 1/72 scale. This can be a bit of a challenge. 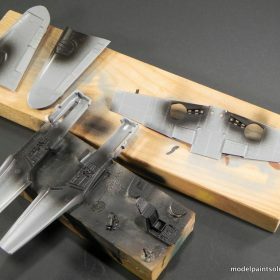 My friend and ace modeler Evan “Lacquer Man” Smith authored a nice article describing his technique here. Before I begin painting I study as many historical photographs as possible. 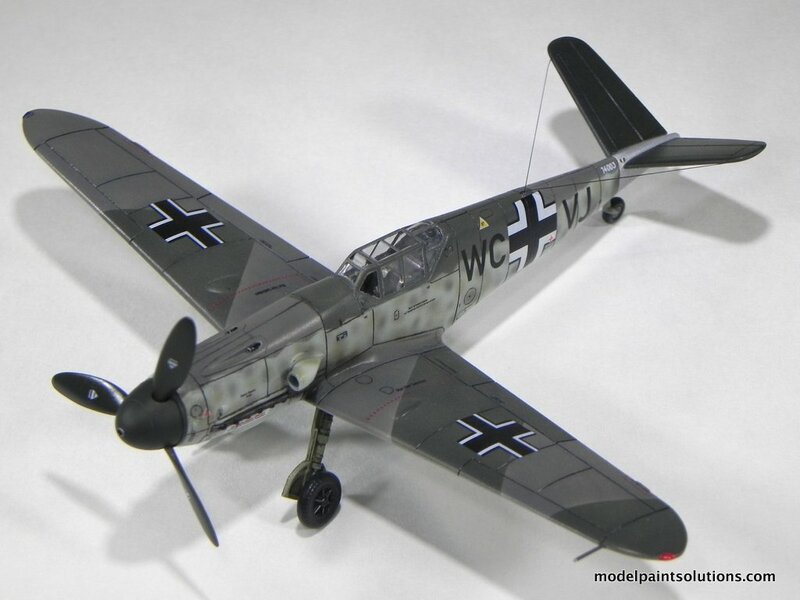 Restored aircraft can have stunningly beautiful but amazingly inaccurate schemes. 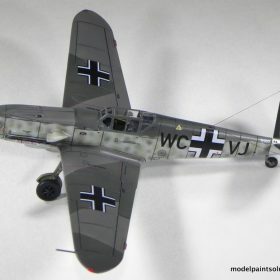 Through a thorough review of the available photos you can access whether the aircraft had the large, simplified early/mid-war mottling or the smaller, squiggle-like mottles seen later in the war or a combination of both. 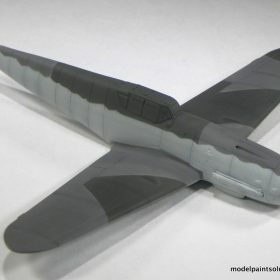 I opted for the larger (and easier) early/mid-war mottling for the V- tail as depicted in the kits painting instructions. For me the first step to successful mottling is setting the brush up for fine-line work: especially when painting in this scale. That entails preparing a sufficiently dilute mixture of paint for fine-line spraying. For this kind of job I dilute Mission Paints 1:1 with Thinner-10. Moreover this was applied using an H&S Infinity fitted with a 0.15mm tip: ideal for this kind of work. With the paint mixed and loaded in the brush, I dial in ~10psi on the compressor and determine the best working distance (distance between the brush tip and the surface being painted) that produces the finest line by practicing on scrap plastic. If I want a finer line, I decrease the pressure to ~6-7psi using an H&S In-line Fine Pressure Control Valve. I also decrease my lever throw, and simultaneously decrease the working distance. 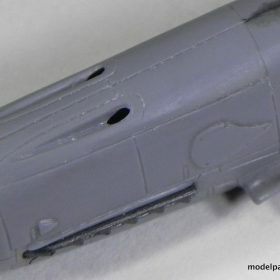 When I’m satisfied with the fineness of the line, I practice mottling on scrap plastic until I’ve enough confidence start in on the model. I also have a microbrush soaking in thinner close at hand so I can periodically wipe the needle as I’m spraying to prevent any errant blobs of paint from landing on my paint job. 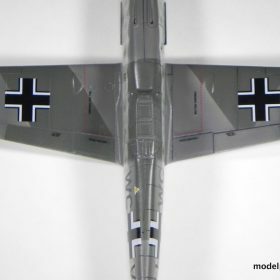 For the V tail, mottles were applied using the previously lightened Mission RLM-74 and -75. It was not uncommon to see mottles of RLM-02 or -81 as well so I added a few mottles in Mission RLM-02 lightened by the addition of 20% Mission White. 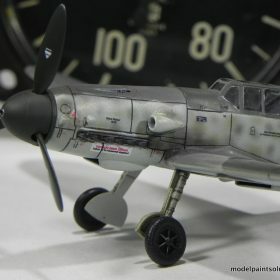 After the mottling was completed the model was shot with Mission Gloss Clear Coat that was diluted with straight Mission Thinner at a ratio of 30:70—Gloss to Thinner. This was shot at ~12psi with an H&S Evolution fitted with a 0.2mm tip. This is an awesome gloss coat! I’ve said for years that I’d never change from Alclad Aqua Gloss but the Mission Gloss is simply better: easier to apply and much more hardy when dry. After a ~2 hr. drying time the kit decals were applied using the Micro-Set and –Sol system and this is when the Mission Gloss Coat really shined (sorry). I saw no reactivity of the dried Mission Gloss to either Micro-Set or –Sol no matter how long they were allowed to sit on the finish. Both of these reagents will eat through dried Alclad Aqua Gloss if left on for too long. This is an awesome gloss coat. After the decals were allowed to dry overnight they were sprayed with coat of Mission Gloss diluted and shot as described above. 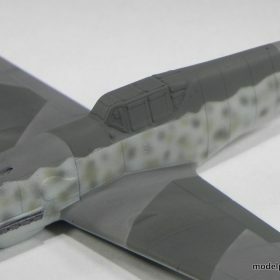 A pin wash of Tamiya Dark Brown Panel Line Accent Color was then applied to most of the airframe using a fine brush. 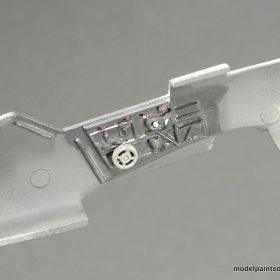 Tamiya Black Panel Line Accent Color was used for control surface hinges, intakes, and such. Excess stain was removed with a Q-tip moistened with Mona Lisa Odorless Paint Thinner.The right side of the model has received the pin washes in the photo (left). After the decaling was complete, the landing gear, gear doors, and pitot tube were attached using Thick CA glue (Bob Smith). The entire model was then given a coat of Mission Flat Clear that was diluted with straight Mission Thinner at a ratio of 20:80—Flat Coat to Thinner. This was shot at ~15psi with an H&S Evolution fitted with a 0.2mm tip. 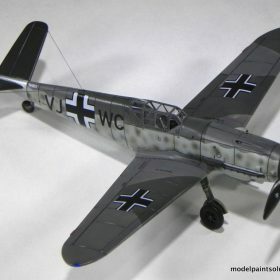 I wanted a semi-gloss to matte finish as this aircraft was probably well maintained being based at the Messerschmitt plant in Augsburg and serving as a test bed for the experimental tail. To ensure I didn’t apply too much Flat I held the brush ~1ft (that’s right one foot) away from the model and applied light, misty dry coats periodically assessing the effect under strong light. 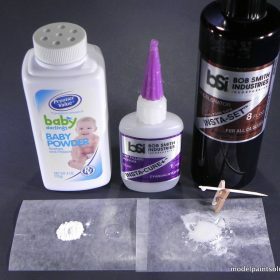 I’ve used this technique with practically all the flat coats I’ve used and it works great. 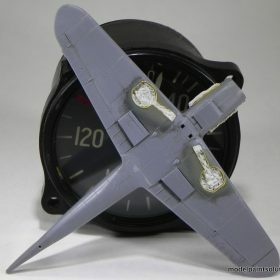 When the Flat coat was dry, the model was given a light buffing with a Micromesh swab moved in the direction of airflow. 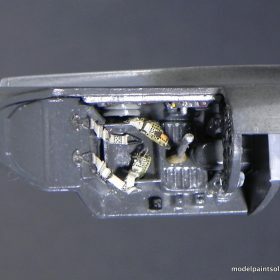 The masks were removed from the canopy and a few moments were spent removing small flecks of paint and masking compound from the canopy using a moistened toothpick. The twin airials were made from Uschi Rigging Thread (#4007) and attached with thick CA (Bob Smith). Whew! Okay so that was a bit of work. 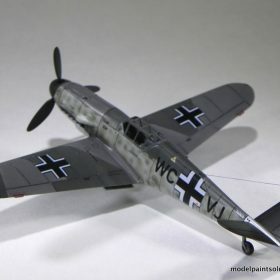 I really love these -109’s from AZmodel. No they don’t fall together: far from it. But, they’re full of detail, make you practice your modeling skills, and they provide a real sense of accomplishment when completed. 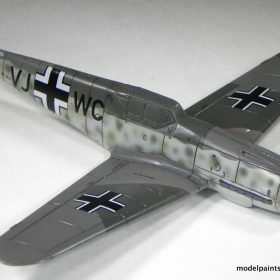 I’ve wanted a V-tail Me-109 on my shelf for a long, long time and thanks to AZmodels, I’ve got one. If you have a little experience with limited production kits and a lot of patience, you’ll enjoy this kit. Well, thanks for reading along! As the build progresses, each update will have a different title image hopefully making it easier for people to follow along. 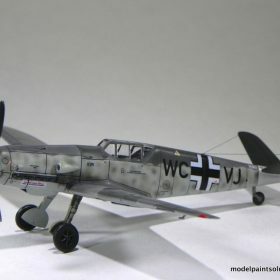 As I said in the review of the kit, I like the AZmodels 1/72 109’s. I’ve built one previously, and have more than I want to admit in ye ole stash. The kit goes together nicely though there are a few steps where a little experience is a big help. I started by removing all the parts from the sprues using a sharp pair of sprue cutters (Xuron). 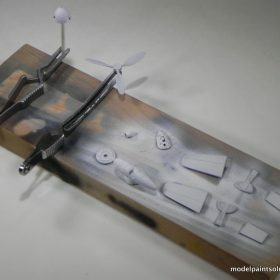 The parts are then given a good once-over using the grey portion of a Triple-Grit sanding stick or, in some cases, a piece of folded Alpha Abrasives 600 grit sheet. 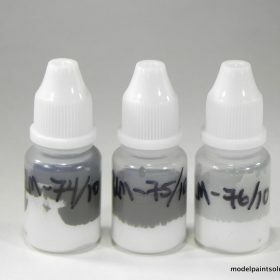 I mix Mission Models Primer with Mission Models Thinner at a ratio of Primer to Thinner of 60:40. That’s 60% Primer to 40% Thinner by volume. Or, for the drop counters out there: 6 drops Primer to 4 drops Thinner. I spray this dilution at ~15-18 psi using an H&S Evolution dual-action brush fitted with a 0.2 or 0.4mm tip. 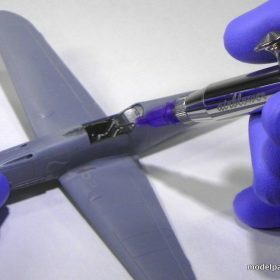 For a model this size, the 0.2mm tip was ideal. 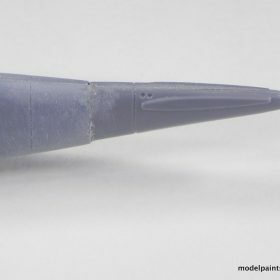 The working distance (space between the airbrush tip and model) was on the order of ~3cm. This primer shoots beautifully: more like a lacquer than an acrylic. It dries in 15-20 minutes (2-3 with a hair dryer) and can be wet buffed with 3600, 4000, or 6000 micromesh pads to achieve a glass-smooth surface: awesome stuff. 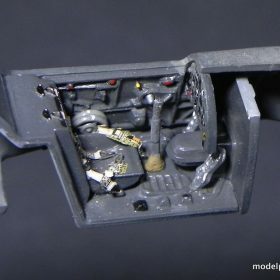 The primed cockpit parts were then shot with Mission Models British Slate Grey to which a few drops of Mission Black was added to achieve a very nice scaled RLM-66. A Mission Models RLM-66 is due in August/September. The wheel wells will be sprayed with Mission Models RLM-02. To spray Mission paints I first prepare a solution of Mission Model Thinner to which Missions Polyurethane Mix Additive (Polymix: a flow and leveling agent) has been added to ~10% by volume. I then dilute Mission Models Paints directly into this solution for spraying. Using a pre-mixed solution of Polymix and Thinner allows you to prepare paint dilutions in a much more reproducible way thereby ensuring that the resulting mixes will spray in a predictable manner. In short, why re-invent the “the paint wheel” every time you mix up a batch of paint? Diluting all your paints with Thinner-10 will greatly decreases batch-to-batch variability. If counting drops is how you roll, no worries. Thinner-10 is roughly 1 drop of Polymix to ~10 drops of Thinner. If you prefer to work in ratios Thinner-10 equates to a ratio of Polymix to Thinner of 1:10. I prepare a large volume (40ml) at a time and store this in an appropriate bottle for use when painting. Properly stored, Thinner-10 lasts for many months (forever?) with no issues. 1) Using a 3.5ml pipette, transfer a total of 4ml of Mission Models Polyurethane Mix Additive to a 40ml beaker. 2) Add Mission Models Thinner up to the 40ml mark on the beaker. 3) After stirring the mix with a spatula, transfer into a 40ml paint storage bottle. For general spraying, I dilute Mission Model paints with Thinner-10 at a ratio of 60% paint, 40% Thinner-10. For the drop counters: 6 drops of paint to 4 drops of Thinner-10. And now, back to the build………. The aforementioned Mission Slate Grey was diluted with Thinner-10 at a ratio of 60% paint, 40% Thinner-10 and sprayed at ~12psi using an H&S Evolution dual-action brush fitted with a 0.2 tip. 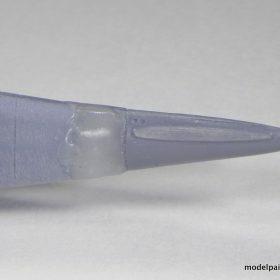 The working distance (space between the airbrush tip and model) was on the order of ~2cm. 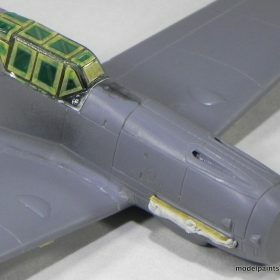 When this was dry, Alclad Aqua Gloss (ALC 600) was carefully applied with a micro brush over all the cockpit parts. I usually spray this but in this small scale brushing it on works just as well. 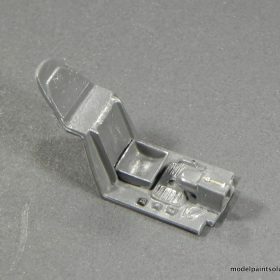 I prefer finishing cockpits of this scale with gloss as it increases the amount of light bouncing around the cockpit once assembled making the finer details more readily visible. It also provides a protective barrier allowing small painting mistakes to be wiped off with a wet Q-tip without damaging the underlying paint. 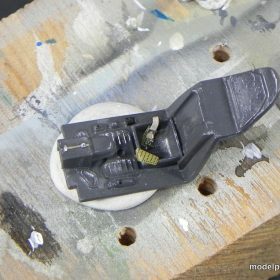 Once the gloss was dry, details on the cockpit side panels and floorboard/seat were picked out using a fine brush and Mission Models White, Red, Black, Blue and Yellow. Scuff marks and a little wear was then replicated using a fine brush and Silver Ink (Color Box Inks). The instrument panel decal was applied over the panel part and wonder of wonders: the fit was near perfect. A small drop of Micro Set was applied and after drying the result is very nice indeed. If you have any questions, comments, or want more information on a tip or trick, post a comment and I’ll get back to you. Now I gotta go paint something! So I ended Part One suggesting that the beautiful seat harness decals provided in the kit were going to be installed in the pilot’s office. All the best laid plans..
Suffice to say I buggered them up completely and had to fall back on my standby, Edward PE belts. But I’m getting ahead of myself……. The seat belt decals provided on the kit decal sheet are very nice indeed. I was quite jazzed about being able to install a “harness” in a fraction of the time required to assemble and install PE belts. The decals came off the sheet normally and the first belt went on perfectly and looked really good. I then carefully picked up the next belt, carefully moved over to the cockpit assembly, and carefully dropped it: Somewhere. Despite a frenzied search and prolific profanity I couldn’t find it. I quickly removed the belt I’d already applied before it dried and set back to ponder my options: ah well. A quick trip the parts stash produced the appropriate photo-etch harness by Eduard (#73002). I later found the tiny, mangled, misshapen, seat harness decal stuck to the hairs of my forearm J Modeling: this is supposed to be fun, right? Right. I chocked the whole situation up to experience, turned my work music up a bit, and set down for some photo-etch work. The tools I use for removing PE belts (and parts) from frets are pretty basic. I remove all parts while the fret is placed on a sturdy piece of tempered glass. This makes the job so much easier. I use a new #11 blade that I place as close to the part as possible and push straight down. With practice you can remove the part with very little of the small connecting PE left attached. 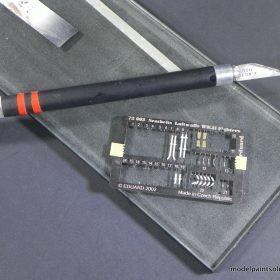 If a small nubbin is left, it can be easily removed with the Tamiya diamond file (#400): great tool. I also wear an Optivisor with number 7 magnifying lenses when doing this kind of work. 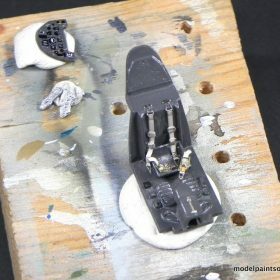 I mount the cockpit floor, seat or tub on a building board (small piece of wood that holds parts being assembled) and place small PE parts on wads of putty or red wax that have been pressed onto the board. In this way both the assembly and parts are all in one place. Before I apply the belts, I decide how I want the seat harnesses to rest on the seat bottom: crossed? Draped? Both? For this job I decided the right lap belt would be in the seat bottom and the left would dangle off the seat edge. To install, I bent the right harness pad so it looks as though it’s resting up against the side of the seat and glued it in place with a small dab of CA applied with a toothpick. I used fine forceps to do the bending.The right belt was then bent in the same fashion (angle and place) and glued on top of the pad with a dab of CA. The left pad was then bent to look as though it was draped over the edge of the seat and glued in place. The left belt was then glued on top of the pad and allowed to dry before the front and rear end of the belt were bent appropriately. Note: It helps to use a little “kicker” or CA accelerant to quickly set the dabs of CA holding the belts in place. I like the kicker made by Bob Smith Industries (#BSI-151). If kicker is used, it’s best to wait a few minutes (~10-15) to give it time to evaporate before applying another belt. It makes life much easier. Each shoulder harness has a mounting bracket on the distal end (away from the pilot) that should be lined up where they mount behind the pilot’s head. I glued both shoulder harnesses in place unbent. This allowed me to look directly down on the assembly and ensure that the mounting brackets were parallel and appropriately spaced. When dry, the harnesses were bent into the appropriate shapes using the ole’ Two Toothpick technique. Briefly, with the mounting bracket stabilized with one toothpick (left hand), each harness was gently bent into place with the other toothpick (right hand). You can substitute small tweezers for the toothpick if you’ve got a soft touch as the color coating on photo-etch belts can be fragile. Small dabs of CA glue were then carefully applied to the undersides of each shoulder harness, which were then pressed down onto the seat bottom and held till the glue was dry. For some variability, I posed the right shoulder strap as though it had fallen along the side of the seat with the left harness is resting on the seat bottom. With the seat harnesses installed, the cockpit floorboard/seat was largely complete so I turned my attentions to one of my favorite parts of an aircraft build: the canopy. 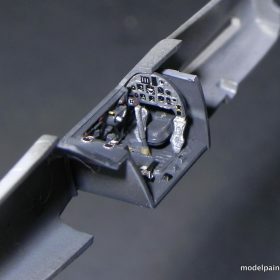 This can be problematic at times if the sprue gate is large and connects to a slender or thin portion of the canopy frame. 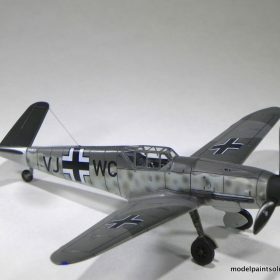 Such is the situation with the AZmodels -109 canopy. Luckily the gate is pretty small but so is the frame to which it’s attached. If mishandled removal of the canopy could result in a crack or a crazing of the clear plastic from stress. I prefer to carefully remove the sprue gate using a photo-etch micro saw. These are available from multiple manufacturers including Tri-Tool, Radu Brinzan Productions, and UMM-USA. To remove the canopy from the sprue, I line the saw blade up with the gate so it’s flush to the canopy piece. As with any saw no matter the scale, I don’t push down but simple move the saw back and forth carefully maintaining alignment. Close examination of the accompanying photo reveals the cut that’s been made about ½-way through the gate. Once removed from the clear sprue, slight damage to the canopy framing is easily dealt with using a folded piece of Alpha Abrasives 1,000 grit sandpaper. I use this under magnification and with a little soapy water. 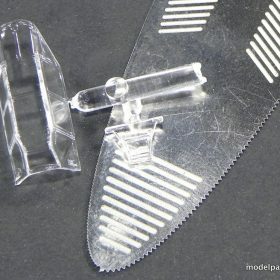 This is awesome stuff to use on clear parts. It doesn’t cause as many unwanted scratches, as would a comparable grit of conventional sandpaper because the surface is finer. 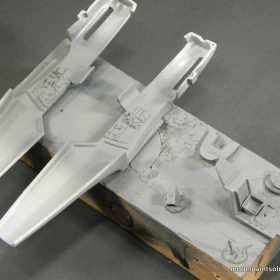 With the canopy removed from the sprue and the attach point smoothed over with 1,000 grit paper, I set about buffing and polishing the canopy in preparation for a quick dip in Future. I have a thing for canopies. You might even call it a fetish but I wish you wouldn’t. 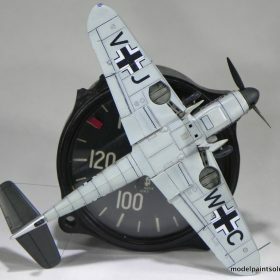 Nonetheless, as a certified wingaholic, I find my eye quickly goes to the pilot’s office whether I’m looking at a 1/72 or a 1/1 scale airplane. That being the case, I’ve spent a fair amount of time working on techniques to ensure I get the cleanest, clearest canopies possible. My first step is a good buffing with Novus Plastic Polish #2 or #3 and either a Polyester or Microfiber polishing swab: depending on the severity of the scratches being dealt with. 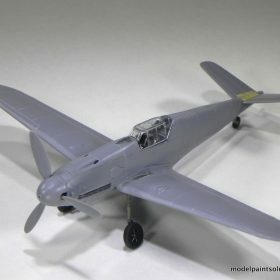 If there are only very fine scratches or imperfections, as is the case with the AZmodels -109 canopy, I buff with Novus #2 (Fine Scratch Remover) and a Microfiber swab. The small size of the swab allows the smaller clear panels both outside and side the canopy to be buffed out: handy. I then follow this up with more Novus#2 on a folded piece of Kimwipe tissue. These tissues are exceedingly smooth, lint free, and dissipate static electricity when used. I was first introduced to them as the only tissue sufficiently smooth and lint-free to clean delicate glass microscope objectives. 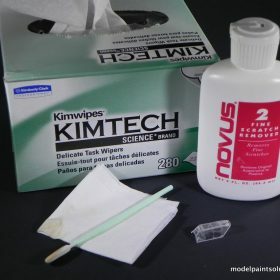 When satisfied with the results of the buffing, I finish the routine with a final polishing with a dry Kimwipe tissue. 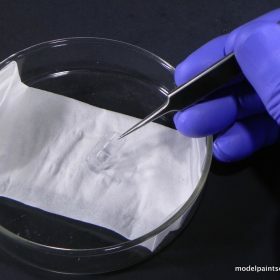 If the scratches were more severe (read deeper into the surface of the clear plastic), I would start the process using the gray portion of the Flexi-Pad Triple-Grit Polisher then something having more bite like Novus #3 (Heavy Scratch Remover) combined with a Polyester polishing swab. I would then switch to Novus #2 and a Microfiber swab when the deepest of the scratches had been dealt with. With the canopy buffed out, it was time for the Future plunge. Future floor wax (or Pledge Floor Care with Future Shine as it’s now called) is my go-to for sealing polished canopies prior to painting or gluing. This is great stuff. To dip a canopy, I completely submerge it in Future and gently buff the part with a Q-tip. To do this, I grab the canopy by the framing as best I can with a small pair of tweezers, hold it submerged in Future, and buff the entirety of it’s surface with a Q-tip. I then pull the canopy out of the Future and carefully touch a piece of Kimwipe tissue to it allowing the excess Future to wick into the Kimwipe. The fact that these tissues are lint free is crucial for this application. After 20-30 seconds, I dip the canopy back into the Future and again remove the excess with a Kimwipe: I due this for a total of 3 dips. After the last, I thoroughly wick the excess Future from the canopy and carefully place it on a folded Kimwipe in a lidded container. 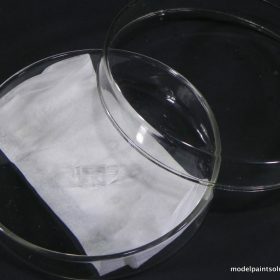 I’ve used an old glass petri dish for this job for years (pictured). The sealed container is then set aside to dry for a minimum of 24 hours (preferably 48) before it’s handled. 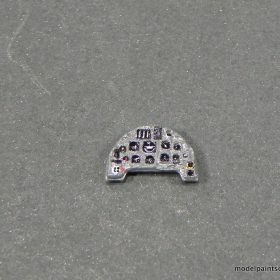 I’ve found the combination of dipping a clear part in Future combined with attaching said part using only Super-Gold CA Glue (Bob Smith Industries) is a guaranteed way of getting fog- or craze-free canopies. The Future protects the clear part from the fumes normally given off by normal CA however, Super-Gold CA is described on the bottle as being “odorless” and it does have less fumes than normal CA glue. When the two products (Future and Super-Gold) are used together the chances of getting a marred canopy is greatly reduced. Good stuff. 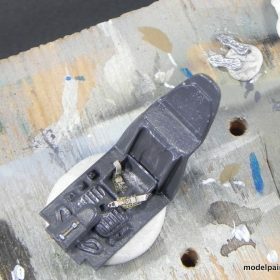 With the floorboard/seat done and the cockpit sidewalls completed in Part one, it was time to start assembling the cockpit. I deviated from the instructions by removing the top portion of part C2 (firewall) so it fit more easily into the fuselage. I also opted to build the cockpit into the left fuselage halve to facilitate alignment. All the components were glued in place with thick CA glue. Now that the cockpit is assembled, we’ll move on to closing up the fuselage and getting the wings together in Part Three. Thanks for reading a long and post a comment if you have a question. Now, I gotta get back to painting something! D) Sealing Up the Cockpit: Another Trick for Clear Canopies. Prior to assembly the wing parts were stuck to a building board with putty so the wheel wells could be sprayed with Mission RLM-02 lightened with ~10% Mission White. This was diluted to 60% paint, 40% Thinner-10 as described above (see Diluting and Spraying Mission Models Paints). The RLM-02 was sprayed at 12psi with an H&S Infinity fitted with a 0.2mm tip. In order for the wells to appear dark when seen through the small oblong perforations in the upper leg well, the underlying area (previously shot with Mission Black Primer) was masked on each upper wing halve. Note in the picture the mask has been removed from one wing half after spraying RLM-02 to reveal the black area. 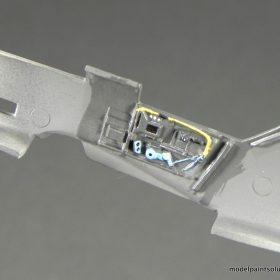 The picture below shows how this area can be seen in the wheel well after assembly. Prior to gluing the wing halves together the oil cooler grills (parts 6 and 7) have to be modified to fit (they’re too tall). 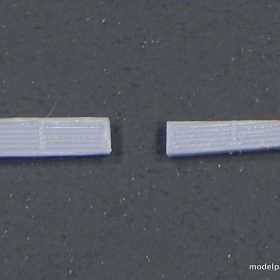 The instructions suggest removing 1mm from the outboard portion of each grill however I found that it required removing more like 2mm to get a clean fit of the wing halves to the single-piece bottom piece. The grills were then shot with Mission Black Primer followed by Mission Aluminum (see below). When dry they were highlighted with a little silver ink applied with a microbrush. The wings were then clamped together and Tamiya Extra Thin Cement was applied to all seems. This was then set aside while I set about closing up the fuselage. With the cockpit built into the left fuselage halve test fitting revealed that the bottom portion of the cockpit tub and the firewall were too wide requiring adjustment with a piece of folded 320 grit Alpha abrasive sheet. The Mission Models metallic colors Cold Rolled Steel (MMM-002) and Aluminum (MMM-003) are less viscous than are the non-metallic Mission paints and therefore require less dilution for spraying. Briefly, either paint (Steel or Aluminum) is diluted to 80% paint, 20% Thinner-10 for spraying. Thinner-10 is simply Mission Thinner to which Mission Polymix has been added to 10%. 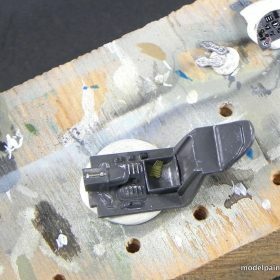 For detailed instructions on preparing Thinner-10, scroll up to “Diluting and Spraying Mission Model Paints” in Part One above. The diluted Mission Steel was shot at ~12psi with an H&S Evolution fitted with a 0.2mm tip. I have to say the Mission metallics spray as nice and with the same coverage as the other colors. This is simply awesome paint. To protect the metal finish on the exhausts each was sprayed with Mission Gloss straight from the bottle. What bottle you ask? There is no Mission Gloss available yet! Not yet, but through the kindness of Mission Models Grand Poobah Jon Tamkin I received a pre-production sample and it shoots just like Mission Primer: like a lacquer! I started the build using my go-to gloss coat Alclad Aqua Gloss but in comparison the Mission Models Gloss is easier to shoot and dries much faster: more on this in a future article. 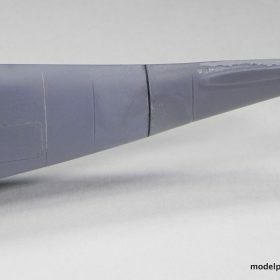 With the exhausts glued in place with thick CA, the fuselage halves were glued together using Tamiya Extra Thin Cement (#87038). I prefer using a “hot” cement like Tamiya Extra Thin because it chemically melts the parts together with a bond composed of plastic. 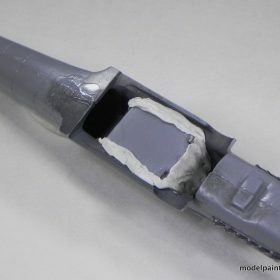 To do this, I carefully paint the bonding surfaces with a liberal amount of Tamiya Thin (or similar) allowing the cement to soak into the plastic making it soft. The parts are then assembled with clamps if possible to ensure the tightest fit. More Tamiya Thin is then carefully applied to the seam allowing the cement to wick in between the two parts. When done properly, a small bead of melted plastic can often be seen emanating from the length of the seam. This plastic goo is a good sign that a strong bond has formed. Once dry, it is removed easily with a sharp blade. In contrast, the use of CA for such an application can leave a hard brittle bond of CA between the two parts. This can be an issue when the restoration of details requires scribing through the CA bond. Cured CA is harder and more brittle than are most model plastics. That being the case, maintaining a straight line while scribing (already a challenge) becomes more difficult if the line passes through an area of CA where the increased hardness will probably make the line wobbly. Worst case, the CA can crack when struck by the scriber producing a hole right in the middle of your pretty inscribed panel line: Been there, done that—didn’t want the t-shirt. 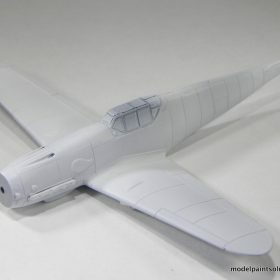 With the fuselage assembled, I set about putting the modified tail cone on and then….. 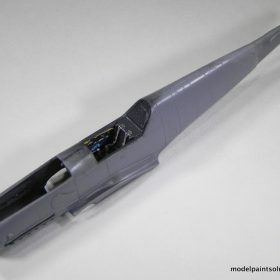 The modified tail cone with two shoulders for the ruddervators is assembled from left and right halves that go together quite innocently. However test fitting to the fuselage from which the conventional tail cone had been removed from frame #8, revealed a less than ideal join. The modified tail is too small in diameter and slightly different in shape than is frame 8. This produced a decided step once the cone was glued in place with Tamiya Extra Thin Cement. This is one of my favorite filler materials. By varying the ratio of CA to talc you can obtain a filler that, when dry, is softer (more talc) or harder (more CA) as is required for the job at hand. A good starting mix is ~40% CA to ~60% talc by volume. When mixed, the resulting paste can be easily maneuvered into seams and cracks with a toothpick or similar tool. Excess filler can be scraped off or removed with an X-Acto blade. Application of a little CA accelerant like Zip-Kicker (Bob Smith) and in a few moments the filled area is dry and ready for sanding: neat trick. With this much CA/talc hanging off this model, I reached for my tried and true sanding tools, a dust mask, turned up the Glenn Miller, and set in for an evening of building a limited run kit. 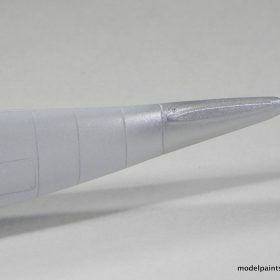 Blending the CA/talc on the tail cone join is a perfect use for one of my favorite and most useful tools: the Flexi-File. Attempting to blend this area with a flat file or sanding stick would result in flat areas that wouldn’t be seen (of course) till they were high-lighted with primer or worse, paint. The Flexi-File adjusts to curves as it’s used leaving no flat spots behind. Moreover, the three grades of abrasive strips (Tan, Grey, and Red) allow you to make quick work of such jobs. 1) Flexi-File with Tan (Coarse) strip. 2) Flexi-File with Grey (Medium) strip. 3) 1000 Grit Alpha Abrasive Sheet. Note #1: To ensure I don’t introduce any flat areas when sanding with abrasive sheets, I cut a small sqaure of 1000 grit sheet (~1 in2), wet it so it becomes supple, place it flat against the model, then carefully sand using a small circular motion with very little pressure: let the sheet to the work. I also wipe the area being sanded often to decrease the grit and lesson scratching to the surrounding plastic. After the CA/talc was sufficiently blended I applied a liberal coat of Mr. Hobby Mr. Resin Primer Surfacer to the entire area. One down side to using Ca/talc is the porosity of the filler: it’s a little grainy even after sanding. Since the tail cane is to be sprayed Mission Aluminum, as smooth a finish as possible is required. This is easily achieved with a fine-grained filler like Mr. Resin: good stuff. 1) Flexi-File with Grey (Medium) strip. 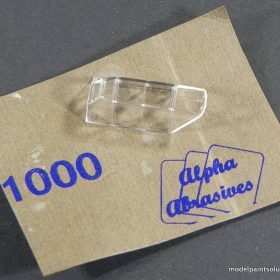 2) 1000 Grit Alpha Abrasive Sheet (see Note #1 above). 3) Flexi-File with Red (Fine) strip. Note: Micromesh either in sheets are on foam pads is awesome as a final polishing step. I use a small piece of 3200 Micromesh sheet (~1in2) to wet buff the area and since it’s cloth, it easily conforms to contours. The 3200 pad is good for areas where I want to exert more pressure when I’m buffing. I alternate between the two always using both with cool soapy water. 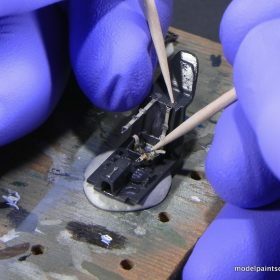 With the tail cone blended in I set about restoring the panel line at fuselage frame #8 and for this job I reached for my go-to scribing tools. 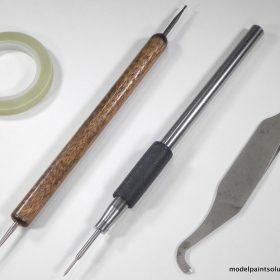 I use a plastic tape or Dymo tape as a scribing guide, an embosser (wooden handle in picture) to burnish the tape down (don’t want it moving), and my two favorite scribers: the old Mission Models handle with it’s needle scriber, and the SCR-001 scriber from UMM-USA. I like to use thin pieces of plastic tape (~1mm) as scribing guides particularly in situations where the line to be scribed is curved or circular. 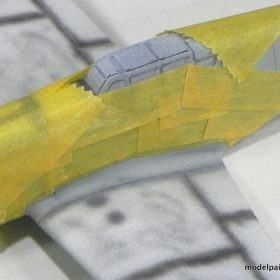 A thin piece of plastic tape easily conformed to the contour of the fuselage allowing the entire panel line to be delineated. Once in place the tape was burnished down and the initial scribe performed using the needle scriber. This was done slowly and carefully with very little pressure to ensure proper alignment with the tape guide. After several (8-10) light passes, the tape was removed and the scribed line was enlarged and deepened using the scriber from UMM-USA. After a light buffing with a piece Micromesh 3200 fuselage frame #8 was considered restored. Note that the inscribed line was highlighted with Tamiya panel wash for photographic convenience. But I wasn’t done yet: oh no. The following sequence of photographs shows the CA/talc trick being used again to repair damage I did to the upper cowl panel line. Note the mangled line just aft of where the spinner would be—Oops! This is the result of using to much pressure and not enough attention while scribing. The damaged area as well as some other areas around the upper cowl were filled in with CA/talc and smoothed using the same tools and process described above. 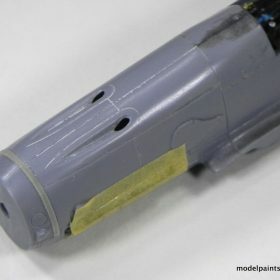 After blending, a piece of plastic tape was used to delineate the panel line and it was restored using first a needle scriber then the UMM-USA scriber. 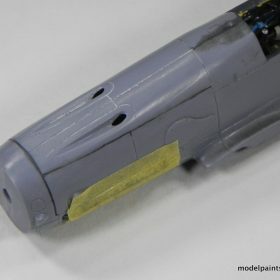 Note that the previously damaged panel line as well as other restored lines have been highlighted with Tamiya panel wash. Also note that the previously damaged line looks thick due to the porous CA/talc taking up the Tamiya wash. This will be dealt with by sealing the CA/talc areas with primer prior to painting. 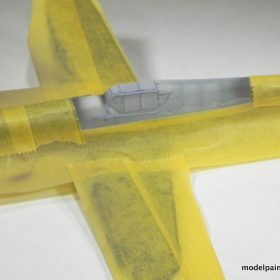 4) Sealing Up the Cockpit: Another Trick for Clear Canopies. With the panel lines re-scribed and the tail cone blended it was time to start thinking about joining the fuselage to the wings. But, before we get to that, lets think about what can be done to ensure that no tiny, nasty, evil, little, piece of schmutz finds itself onto the inside portion of our crystal clear canopy. How many times has this happened to you? It’s happened too many times to me I can assure you. To lesson the chances of this happening I prefer to seal the cockpit tub from the inside of the fuselage so that no dust or plastic particles can enter through various intakes and ports and migrate to my pretty canopy. 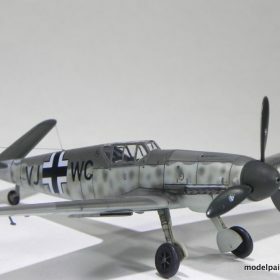 This is easily done by placing small putty worms along any gaps between the tub and fuselage that are then mashed into place with a toothpick. 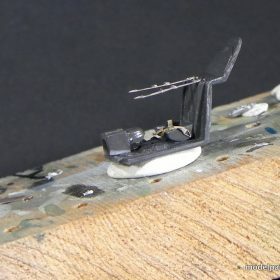 If I don’t have access to the cockpit tub though the bottom of the fuselage as I do with this V tail 109, I strategically place pieces of putty along the tub that will be mashed into place when the fuselage halves are joined. This takes more planning and some extra work but it is so worth it in the end when the canopy is in place and all the work invested in making and keeping the canopy clear during assembly pays off. The canopy is the focal point of most aircraft builds so a little extra effort here goes a long way. 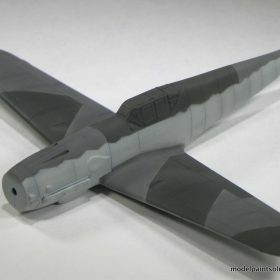 With the cockpit tub sealed, I joined the fuselage to the wings using Tamiya Extra Thin as described above. The fit is not ideal (remember this ain’t no Tamigawa) but the required work isn’t that bad either. Now that the major components are assembled, I’ll set about filling any gaps, restoring any damaged panel lines and start thinking about getting some primer on this V tail. Now, I gotta go prime something!